Congratulations to the five marine energy developers who will benefit from £7.9 million funding to further develop testing of new wave and tidal prototypes in the seas around Scotland. The announcement was made following the Deputy First Minister Nicola Sturgeon’s visit to Scotrenewables Tidal Power Ltd yesterday to view the company’s SR250 tidal turbine prototype currently on test at EMEC. 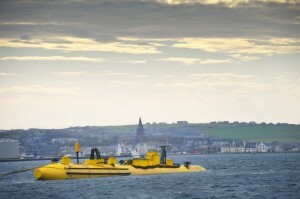 The second round of WATERS (Wave & Tidal Energy: Research, Development & Demonstration Support) funding is to enable Scottish developers and supply chain firms to capture an increased share of the growing international marine energy market, which could be worth up to £4 billion to Scotland’s economy by 2020. For the full press release, visit the Scottish Government website.